Last Sunday Sam and Sylvia earned their Working Certificate Excellent title! 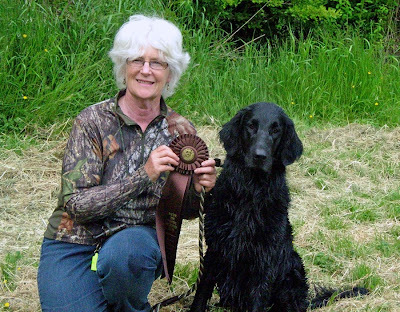 The Canadian WCX test includes two doubles (on land and in water), a walk-up and honour and two blind retrieves, one on land and one in water. Sam did a terrific job and is now HR Blazingstar Bobolink JH WCX TD. Congratulations to Sam and his owners Sylvia and J! We are very proud of this team. Thank-you to Rod Deacon for sending us photos! whoo hoo!! !, congratulations to Sylvia & Sam !! !